In 1938, John Rule and Gordon Wynn established their firm, which eventually became one of the leading architectural practices in western Canada. John's brother, Peter Rule, joined the firm in the following year. With offices in both Edmonton and Calgary, the firm achieved some success in institutional commissions, such as schools and hospital renovations. 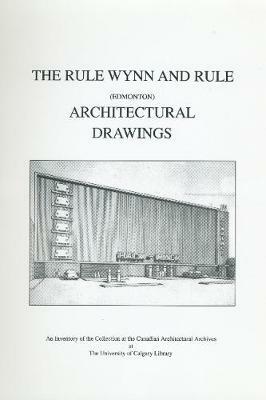 After the war, Rule Wynn and Rule were commissioned to do the headquarters for the Greyhound Buslines Terminals in Calgary, Winnipeg, Lethbridge, Fort MacLeod, Kingsgate, B.C., and Edmonton. During the 1950s, the firm designed a number of significant office buildings in Calgary as well as the Rutherford Library at the University of Alberta and the Rialto Theatre, the Weston Bread factory and the AGT (Alberta Government Telephones) building in Edmonton. They also designed the original buildings for the Banff Centre. The holdings of the Canadian Architectural Archives focus on the architecture of twentieth-century Canada and the work of its outstanding architects.